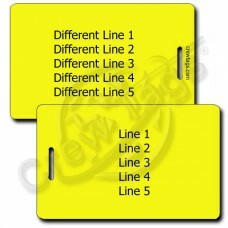 If you are into Yellow, these luggage tags will fit right in! You will find several different varieties to match your every mood. 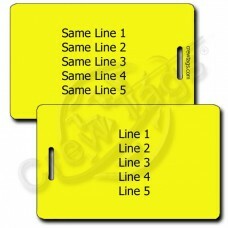 We have Yellow Plastic Luggage Tags printed with your own information printed directly on the tag, or if you want to be able to change your information quickly on the fly, we have a variety of Business Card Holder and Privacy Protection Luggage Tags too! They are simply the easiest, fastest and best way to spot your bag on a crowded airport carousel more quickly. In a world filled with black luggage, a little color is a nice thing. These Yellow Plastic Lugg..
Take your Guardian Angel with you wherever you go! These Yellow Emoticon Angel Luggage Tags are fun .. When you are smiling, the whole world smiles with you! Right? If not, take this Yellow Big Grin Emot..
Let everyone know what you really think of flying! These cute Yellow Bored Emoticon Luggage Tags are..
What can be better than the Yellow Classic Smiley Emoticon Luggage Tags? These cute tags are fun add.. Cowboy Up! These cute Yellow Cowboy Luggage Tags are fun addition to any bag that you might want to .. Some days just feel like this. These cute Yellow Frown Luggage Tags are fun addition to any bag that..
Take this Yellow Emoticon Heart with you wherever you go! These tags are fun addition to any bag tha.. These cute Yellow Homer Luggage Tags are fun addition to any bag that you might want to find quickly..
Not everyone is born perfect! Celebrate left handedness with these these cute Yellow Luggage Tags. T..
For some devilishly good fun grab a couple. These cute Little Devil Emoticon Luggage Tags are fun ad.. Cheer up your luggage with these cute smiley emoticon tags. These tags are fun addition to any bag t.. Some times you just have to blow a big raspberry! These cute Yellow Tongue Sticking out Luggage Tags..
Wink, What Wink? that was just a twitch.... These cute Yellow Emoticon Wink Luggage Tags are fun add..